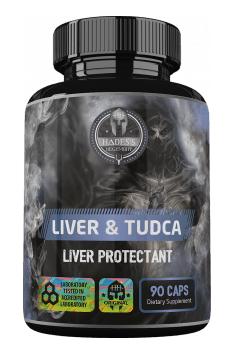 Hades’s Hegemony Liver & Tudca is a 3-component dietary supplement which contains tauroursodeoxycholic acid, N-acetylcysteine and milk thistle extract. The product protects liver cells, supports liver regeneration and detoxification, reduces the harmfulness of toxic substances and shows supporting therapeutic properties in cases of liver and bile ducts diseases. The product is recommended for people who need liver support because of long-term use of drugs, oral anabolics, alcohol or other harmful substances. The supplement is also recommended in the case of cholestatic disorders of liver and bile ducts functions. Liver is an organ that participates in the majority of transformations in the human body system. It is responsible for the metabolism of carbohydrates, lipids, proteins, drugs and toxic substances. As its role is of great importance, it is worth to take care of it because any disorder in liver functions may seriously affect live and health. Tauroursodeoxycholic acid (TUDCA) is a hydrophilic bile salt, which means that it is well soluble in water. The compound is present in the human body system and shows cholagogic, neuroprotective, immunomodulating, hepatoprotective and antiapoptic properties. It also improves the insulin sensitivity of cells. TUDCA is used mainly as a support in the treatment of liver and bile ducts disorders that are accompanied by cholestasis (e.g. primary sclerosing cholangitis and gallstones) as well as it supports liver regeneration as it reduces the harmfulness of toxic substances and anabolics and accelerates their removal. TUDCA is also used in order to prevent gastrointestinal tumours. The mechanism of cholestasis is based mainly on a limited outflow of bile from the liver to the duodenum caused by the decrease in the production of bile (intrahepatic cholestasis) or the obstruction of bile ducts (extrahepatic cholestasis). Intrahepatic cholestasis is associated mainly with the activity of substances damaging hepatocytes, which often leads to alcoholic and non-alcoholic fatty liver. Extrahepatic cholestasis concerns bile ducts (gallstones, bile duct tumour, chronic pancreatitis, carcinoma of pancreatic head). TUDCA improves the flow of bile and stimulates its production, and also protects choloangiocytes (the epithelial cells of bile ducts) and hepatocytes from the toxic effects of other hydrophobic bile acids, which can accumulate in the liver as a result of cholestasis. Deposits of bile in the case of gallstones are typically made of cholesterol. TUDCA facilitates cholesterol dissolution and thus contributes to the dissolution of gallstones, which may result in their painful excretion via urine. It has been observed that TUDCA may support the regulation of the carbohydrate metabolism. As it turns out, this substance improves the sensitivity of cells to insulin and also supports protection against hyperglycaemia. N-acetylcysteine (NAC) is a derivative of the L-cysteine amino acid and has the ability to bind free radicals because it contains free sulfhydryl groups –SH. In the body system, acetylcysteine is metabolized to cysteine, which is a precursor to glutathione, one of the most powerful antioxidants present in our organism. NAC, as a substrate for the synthesis of glutathione, plays a vital role in protecting liver cells from damages caused by toxic substances. As a result of toxins action (e.g. alcohol abuse, smoking), it comes to an increase in oxidative stress, increased use of glutathione and a decline in its level in the body system, so it is important to regularly replenish its level. In addition to the antioxidant properties, glutathione is also involved in the detoxification of xenobiotics. Milk thistle contains silymarin, a group of flavonolignans, which have a protective effect on the liver cells as a result of her exposure to toxins (e.g. ethanol, carbon tetrachloride). Silymarin is also effective in the case of cells that have already been damaged. This substance prevents the ingress of substances toxic to the hepatocytes interior, and also prevents cells apoptosis. Moreover, it protects liver cells from the harmful effects of free radicals, stimulates the production of new hepatocytes and has cholepoietic properties. Milk thistle extract is used among others in the case of food poisoning and liver cirrhosis of alcoholic etiology. Furthermore, this substance can be used for cancer prevention and as a support in normalization of blood glucose level. To sum it all up,, Liver & Tudca is a dietary supplement that is very effective as a support in the treatment of kidney stones, liver cirrhosis as well as after alcoholism and during or after using anabolic agents. The product can also be used during the treatment of alcohol abuse, however, you should keep in mind that it is not allowed to take the preparation before consumption of alcohol, as it can cause the opposite effect and have a negative impact on the liver functions. The supplement is also recommended in poisonings and long-term use of drugs that may have hepatotoxic properties. The product has a beneficial impact on the normalization of blood glucose as well as shows anticancer properties, which is important in the prevention of lifestyle diseases. Liver & Tudca 90 caps. As a dietary supplement, take 1 capsule to 3 times daily with a meal. In case of slight disorders of the parameters defining liver function or just for prophylaxis, the dose of one capsule a day may be sufficient. However, when we use Liver & Tudca in order to protect the liver for example during steroid cycle or taking invasive drugs, the daily dose may be increased to 3 capsules, divided into 2 or 3 portions during the day. The time of application is not imposed, as it should be adjusted to the time of drug application or the pace of progress in test results. Taking during or after a meal is the most optimal option. Tauroursodeoxycholic acid (TUDCA) is a bile salt found naturally in the body. It has hydrophilic properties and is thus characterised by very good solubility in water. TUDCA is targeted at improving the flow of bile and promoting its production. What is more, it protects hepatocytes (liver cells) and cholangiocytes (epithlial cells of the bile duct) against harmful effects of toxins and promotes their efficient regeneration. TUDCA supplementation is recommended mainly to promote the treatment of disorders of the liver and bile duct accompanied by cholestasis. In addition, it may be a perfect solution for individuals who want to improve detoxification and liver regeneration, e.g. caused by alcoholism or anabolic agents and hepatotoxic medicines.